September 2018: The Actuary Career Fair! This year’s Actuary Career Fair will be held on Tuesday September 25th in LGRT 1634, from 5:30pm-8:30 pm. Sandwiches and other refreshments will be provided. This is a great opportunity to talk with recruiters about externships, internships, and full-time positions. Even if you are a freshman or sophomore, come to start building relationships with recruiters and learn the process for gaining future employment. More details will be provided at the beginning of the school year. (I) Micaela Keating (Captain); Cassidy Giacoppo, Andrew Skrzypczak; Bryan Tran. (II) Jingsheng Huang (Captain), Brendan Holman, Huixi Liang, Qi Xiao. April 12th, 2018: GIS offered the Excel Workshop on April 12th 4:30-6:30. The amazing Diana offered a training about Microsoft Excel. As future actuaries, students will absolutely use Excel a lot. Therefore, learning Excel now will give our students an extra boost and make their work at an internship or job much easier. During the workshop GIS used real financial data to help our students learn Excel, including about how to find variance, optimal portfolio, and more. April 3rd, 2018: GIS offered the Course Advising Help (5:30-6:30 pm LGRT): In this event, the GIS officers answered all the questions and more that students had about classes. March 19th, 2018: Aetna hosted an event on Monday March 19th at 6pm in LGRT 1634. This provided a great way to ask questions about the actuarial field and network with industry (and students). Jan 21, 2018: the UMass GIS organized a welcome event at 4pm in LGRT 1528. We discussed our plan for this semester and going over officer positions. Recruiters LOVE to see a leadership position on resumes, especially one that relates to the field our students are applying for! This is a great way to distinguish one from other applicants. October 2017: The Actuarial Career Fair was held on September 26. 14 companies attnded the fair, including several first-time companies. March 2017: We have 12 students who have passed two or more exams and 14 others who have passed one exam. Congratulations to these 26 students! Thanks to the generosity of Bob and Lynne Pollack, we now offer all students full reimbursement for passing any of Exam 1/P, Exam 2/FM, or Exam 3F/MFE. Additionally, we are able to help out with the costs for study materials, up to $75 per exam. Reimbursements are paid from the Bob and Lynne Pollack Actuarial Exam Fund. April 2016: The Actuarial Club has become a chapter of Gamma Iota Sigma and has a new webpage: GIS. Officer elections were held on April 6 and the chartering banquet was on April 29. We were pleased to have Gamma officers from Howard University, UConn, and the University of Hartford help us out with the ceremony. Dean Cave introduced the event, Roger French from the Central Massachusetts Chapter of the CPCU Society spoke, and four alumni from Liberty Mutual and a senior recruiter from the Hanover attended. Rising senior Daniel Wu is the president of our new chapter. See more announcements below, including information about reimbursement for exam fees and study material expenses. The actuarial field is a vibrant one and a great way to put to use the mathematics and statistics knowledge you are learning as a major. Actuary is listed as the 4th best job in the 2014 U.S. Bureau of Labor Statistics survey behind Mathematician, Tenured Professor, and Statistician. The Department of Mathematics and Statistics offers several courses to prepare students for an actuarial career, including courses to prepare for the first two actuarial exams. We are one of only three institutions in Massachusetts on the 2018 UCAP list(link is external) maintained by the Society of Actuaries. We currently have 180 students selecting the Actuarial Concentration within the major, several of whom are also majoring in another field (Finance, Engineering, Economics,...). Our alumni are employed at insurance and other financial companies throughout the country. We have an active Actuarial Club(link is external) that holds events throughout the year. Our Casualty Actuary Society (CAS) University Liaisons are Chad Wilson and Hayley Shi, from Travelers. Chad is a Fellow of the CAS and Hayley is active in the Property and Casualty analytics space and is also a recent UMass graduate. Thanks to Robert Pollack, Hanover Insurance, and the Actuarial Club of Hartford and Springfield for generous donations to the program this year. Companies with internship or job opportunities for our students should contact the Actuarial Coordinator, HongKun Zhang . There will be changes the VEE requirements, starting July 1, 2018. See https://www.soa.org/Education/General-Info/2016-vee-requirements.aspx. In particular, VEE Applied Statistics will end (it will become a full exam,) and VEE Mathematical Statistics will take its place. There will also be some changes to VEE Corporate Finance. Currently the following series of UMass Amherst courses can be used to satisfy VEE requirements. The updated information can be checked at VEE Directory of Approved Courses and Alternate Options. § Economics. Both components below must be covered. 1. Microeconomics component: Economics 103. 2. Macroeconomics component: Economics 104. 1. Accounting component: Accounting 211. This course will be offered starting from Spring 2019. 2. Finance component: Finance 301. Math majors who have declared the Actuarial concentration may contact Jacob Lagerstrom to submit a request to be enrolled in Finance 301. Requests for enrollment should occur during advising week. Part of the previous VEE on Applied Statistical Methods has been evolved to an independent full exam, named Statistics for Risk Modeling. A student may prepare for this exam by taking Stat 597TS, Stat 525. The department offers several courses related to the actuarial exams. Students must take at least one of the exam courses, and also the Math Finance course (Math 537), for the concentration. · Exam P/1: This is an exam covering probability. Math 536 is a course dedicated to preparing students for the exam. 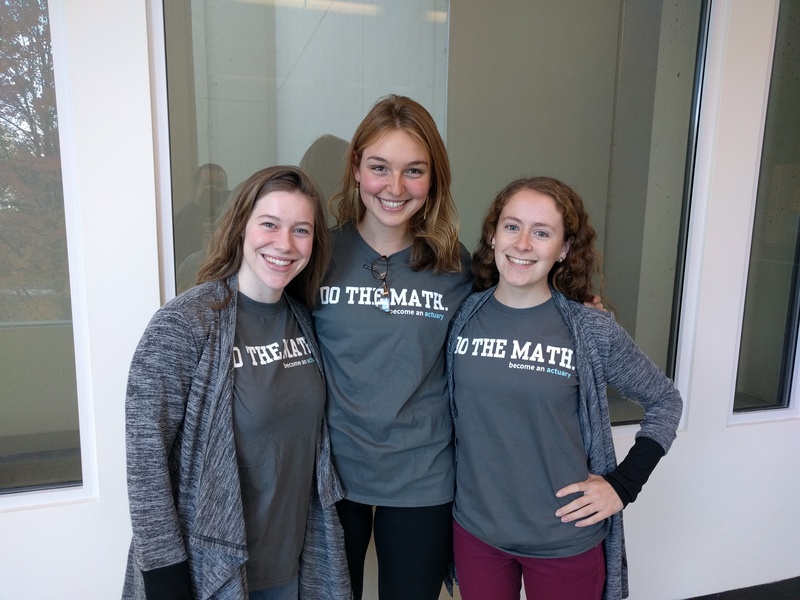 The underlying material is covered in Stat 515 and Math 233 and a few students have taken the exam after completing just those courses by studying on their own. · Exam FM/2: The updated version of this exam covers just the interest rate theory material. Math 437 is dedicated to preparing students for this exam. Some of the material is also touched upon in Finance 301. · Exam SRM (Statistics for Risk Modeling NEW): This is one of the two components on the new curriculum that is devoted to predictive analytics education. It provides the transition from mathematical statistics as presented in the Probability Exam and Mathematical Statistics VEE to predictive analytics and its applications. It covers the regression and time series topics formerly in the Applied Statistics VEE subject. This exam will add the generalized linear model. This exam will be CBT and will be a formal prerequisite for the Predictive Analytics Exam. Stat 597TS, Stat 525 is dedicated to preparing students for this exam. Some of the material is also touched upon in Finance 301. · Parts of Exam MFE/3: Math 537 covers a good portion of the subject matter of this exam, but 537 is not an exam preparation course per se. · MAS-I: Stat 597TS, Stat 525, Stat 515, Stat 516 will cover a good portion of the following topics: Probability Models (Stochastic Processes and Survival Models); Statistics; Extended Linear Models; Time Series with Constant Variance. · MAS-II: will cover the following topics: Introduction to Credibility, Linear Mixed Models; Bayesian Analysis and Markov Chain Monte Carlo; Statistical Learning. The other requirements for the concentration are found on the main undergraduate page. · Complete Stat 515 in your sophomore year. · Take an exam course (typically, Math 536) during your sophomore year so that you can pass one exam by the summer before junior year. This makes it more likely to secure an internship during the Actuarial Career Fair and thus have an internship during the summer between junior and senior year. · Bob and Lynne Pollack Actuarial Exam Fund: The department will reimburse the full fee for any of the first three exams that are successfully passed. In addition, we will reimburse up to $75 in study material costs for the passed exam. Please contact Jinguo Lian for more details. · The Actuarial Club(link is external) is now a chapter of Gamma Iota Sigma(link is external), a national organization of students interested in risk and insurance (including actuarial science). See also the campus pulse page here(link is external).